What Is Quinoa and How Do You Cook With It? Quinoa can be served as a side dish, but topped with fruit makes for a healthy breakfast, too. Quin-what? Pronounced “keen-wah,” this protein-packed grain is experiencing a moment in the spotlight and showing up on more restaurant menus and recipe sites than ever before. So just what is quinoa and how do you make it? Learn more below. 1. What is quinoa? 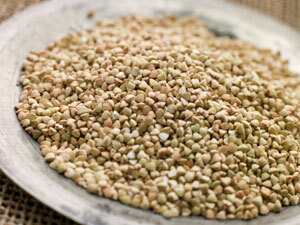 Quinoa is actually a seed, rather than a grain, that can be traced back to ancient Peru. Packed with protein, quinoa contains every amino acid, and is particularly rich in lysine, which promotes healthy tissue growth throughout the body. Quinoa is also a good source of iron, magnesium, vitamin E, potassium, and fiber. 2. How does it taste? Quinoa looks a bit like couscous and is as versatile as rice, but it has a richer, nuttier flavor than either of them. The seeds have a naturally bitter coating to deter birds that must be soaked off before preparing. Packaged quinoa has likely been pre-soaked, but be sure to read the fine print before cooking. 3. How do you cook quinoa? 3. Pour into a pot and add 1.5 cups of water and a half teaspoon of salt. 4. Boil, then cover with a tight-fitting lid. 5. Simmer for 15 minutes. 6. Remove from heat and let sit for 5 minutes, covered. 7. Fluff with a fork and serve. 4. What are the best ways to serve it? Quinoa can be served on its own as a side dish, with a bit of butter or oil, salt and pepper, or other seasonings. It also makes a great breakfast dish mixed with dried fruit, cinnamon, milk, and maple syrup or honey. Paired with chili, stir-fries, beans or curries, quinoa is a healthy substitute for rice (it also makes a tasty pilaf). As a main course, use it to make meat-free burgers, mix it into stews or toss it into salads. Quinoa works as a baking grain as well, and makes for delicious and nutritious breads and muffins. © 2012 The Reader’s Digest Association, Inc.